Education Schools Religion USA - The First Amendment Center - How should I teach about religion? Encouraged by the new consensus, public schools are now beginning to include more teaching about religion in the curriculum. In the social studies especially, the question is no longer Should I teach about religion?” but rather “How should I do it? >The school’s approach to religion is academic, not devotional. >The school strives for student awareness of religions, but does not press for student acceptance of any religion. >The school sponsors study about religion, not the practice of religion. >The school may expose students to a diversity of religious views, but may not impose any particular view. >The school educates about all religions; it does not promote or denigrate religion. >The school informs students about various beliefs; it does not seek to conform students to any particular belief. Classroom discussions concerning religion must be conducted in an environment that is free of advocacy on the part of the teacher. Students may, of course, express their own religious views, as long as such expression is germane to the discussion. But public-school teachers are required by the First Amendment to teach about religion fairly and objectively, neither promoting nor denigrating religion in general or specific religious groups in particular. When discussing religion, many teachers guard against injecting personal religious beliefs by teaching through attribution (e.g., by using such phrases as “most Buddhists believe or “according to the Hebrew scriptures. Which religions should be taught and how much should be said? Decisions about which religions to include and how much to discuss about religion are determined by the grade level of the students and the academic requirements of the course being taught. In the elementary grades, the study of family, community, various cultures, the nation, and other themes and topics may involve some discussion of religion. Elementary students are introduced to the basic ideas and practices of the world’s major religions by focusing on the generally agreed upon meanings of religious faiths —the core beliefs and symbols as well as important figures and events. Stories drawn from various faiths may be included among the wide variety of stories read by students, but the material selected must always be presented in the context of learning about religion. On the secondary level, the social studies, literature, and the arts offer opportunities for the inclusion of study about religions—their ideas and practices. The academic needs of the course determine which religions are studied. In a U.S. history curriculum, for example, some faith communities may be given more time than others but only because of their predominant influence on the development of the American nation. In world history, a variety of faiths are studied in each region of the world in order to understand the various civilizations and cultures that have shaped history and society. The overall curriculum should include all of the major voices and some of the minor ones in an effort to provide the best possible education. 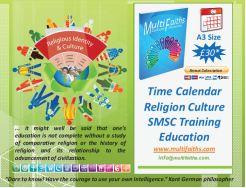 Fair and balanced study about religion on the secondary level includes critical thinking about historical events involving religious traditions. Religious beliefs have been at the heart of some of the best and some of the worst developments in human history. The full historical record (and various interpretations of it) should be available for analysis and discussion. Using primary sources whenever possible allows students to work directly with the historical record. Of course, fairness and balance in U.S. or world history and literature are difficult to achieve, given the brief treatment of religious ideas and events in most textbooks and the limited time available in the course syllabus. Teachers will need scholarly supplemental resources that enable them to cover the required material within the allotted time, while simultaneously enriching the discussion with study of religion. Some schools now offer electives in religious studies in order to provide additional opportunities for students to study about the major faith communities in greater depth. May I invite guest speakers to help with study about religion? When teaching about religions in history, some teachers may find it helpful to invite a guest speaker for a more comprehensive presentation of the religious tradition under study. Teachers should consult their school district policy concerning guest speakers in the classroom. If a guest speaker is invited, care should be taken to find someone with the academic background necessary for an objective and scholarly discussion of the historical period and the religion being considered. Faculty from local colleges and universities often make excellent guest speakers or can make recommendations of others who might be appropriate for working with students in a public-school setting. Religious leaders in the community may also be a resource. Remember, however, that they have commitments to their own faith. Be certain that any guest speaker understands the First Amendment guidelines for teaching about religion in public education and is clear about the academic nature of the assignment. Teachers must be alert to the distinction between teaching about religious holidays, which is permissible, and celebrating religious holidays, which is not. Recognition of and information about holidays may focus on how and when they are celebrated, their origins, histories and generally agreed upon meanings. If the approach is objective and sensitive, neither promoting nor inhibiting religion, this study can foster understanding and mutual respect for differences in belief. Teachers may not use the study of religious holidays as an opportunity to proselytize or otherwise inject personal religious beliefs into the discussion. The use of religious symbols, provided they are used only as examples of cultural or religious heritage, is permissible as a teaching aid or resource. Religious symbols may be displayed only on a temporary basis as part of the academic lesson being studied. Students may choose to create artwork with religious symbols, but teachers should not assign or suggest such creations. The use of art, drama, music or literature with religious themes is permissible if it serves a sound educational goal in the curriculum. Such themes should be included on the basis of their academic or aesthetic value, not as a vehicle for promoting religious belief. For example, sacred music may be sung or played as part of the academic study of music. School concerts that present a variety of selections may include religious music. Concerts should avoid programs dominated by religious music, especially when these coincide with a particular religious holiday. This advice about religious holidays in public schools is based on consensus guidelines adopted by 18 educational and religious organizations. Are there opportunities for teacher education in study about religion? Teacher preparation and good academic resources are needed in order for study about religion in public schools to be constitutionally permissible and educationally sound. The First Amendment Center supports initiatives in several regions of the country designed to prepare public school teachers to teach about religion. The most extensive of these programs is the California 3Rs Project (Rights, Responsibilities, and Respect). Co-sponsored by the California County Superintendents Educational Services Association, the project has created a network of resource leaders and scholars throughout the state providing support for classroom teachers. Teachers trained by the project give workshops for their colleagues on the constitutional and educational guidelines for teaching about religion. Religious studies scholars from local colleges and universities are linked with school districts to provide ongoing expertise and periodic seminars on the religious traditions that teachers are discussing in the curriculum. The Utah State Office of Education co-sponsors a Utah 3Rs Project that is currently building a network of resource leaders in all of the state’s school districts. Other states and districts have similar programs in various stages of development. Harvard University and the University of Pennsylvania offer master’s level programs that are excellent opportunities for both current and prospective public- and private - school teachers interested in learning more about the study of religion and religious-liberty issues in American public life. Education Resource Center at California State University – Chico. This center provides resources, including curriculum guides and sample lessons in several subject areas. Other organizations, such as the Council on Islamic Education, offer academic resources and workshops on teaching about specific religious traditions. What are good classroom resources for teaching about religion? Teaching about religion in the public schools requires that sound academic resources be made readily available to classroom teachers. Fortunately, good classroom resources, especially in the social studies, are now available for helping teachers integrate appropriate study about religion. Finding Common Ground: A First Amendment - Guide to Religion and Public Education, published by the First Amendment Center, provides an extensive list of organizations and publishers that offer classroom resources for teaching about religion in public schools. Religion in American Life is a 17-volume series written by leading scholars for young readers. Published by Oxford University Press, the series includes three chronological volumes on the religious history of the U.S., nine volumes covering significant religious groups (Protestants, Catholics,Jews, Orthodox Christians, Mormons, Muslims, Hindus, Buddhists, Native Americans and others), and four volumes addressing specific topics of special importance for understanding the role of religion in American life (women and religion, church-state issues, African American religion, and immigration). Columbia University Press has published a CDROM entitled On Common Ground: World Religions in America. This multimedia resource uses text, primary sources, photographs, music, film, and the spoken word to bring alive the extraordinary religious diversity in the United States. Fifteen different religions in various regions of America are represented, from the long-established Christian, Jewish, and Native American traditions to the more recent arrivals such as Hinduism and Buddhism. What is the relationship between religion and character education? As discussed previously, the First Amendment prohibits public-school teachers from either inculcating or inhibiting religion. Teachers must remain neutral concerning religion, neutral among religions and neutral between religion and non-religion. But this does not mean that teachers should be neutral concerning civic virtue or moral character. Teachers should teach the personal and civic virtues widely held in our society, such as honesty, caring, fairness,and integrity. They must do so without either invoking religious authority or denigrating the religious or philosophical commitments of students and parents. When school districts develop a plan for comprehensive character education, they should keep in mind that the moral life of a great many Americans is shaped by deep religious conviction. Both the approach to character education and the classroom materials used should be selected in close consultation with parents and other community members representing a broad range of perspectives. When care is taken to find consensus, communities are able to agree on the core character traits they wish taught in the schools and how they wish character education to be done. For guidance on how to develop and implement a quality character education program, contact the Character Education Partnership in Washington, D.C. The Personal Beliefs of Teachers - May I pray or otherwise practice my faith while at school? As employees of the government, public-school teachers are subject to the Establishment Clause of the First Amendment and thus required to be neutral concerning religion while carrying out their duties as teachers. That means,for example, that teachers do not have the right to pray with or in the presence of students during the school day. Outside of their school responsibilities, public school teachers are free like other citizens to teach or otherwise participate in their local religious community. But teachers must refrain from using their position in the public school to promote their outside religious activities. Teachers, of course, bring their faith with them through the school house door each morning. Because of the First Amendment, however, teachers who wish to pray or engage in other religious activities —unless they are silent—should do so outside the presence of students. If a group of teachers wishes to meet for prayer or scriptural study in the faculty lounge during their free time in the school day, we see no constitutional reason why they may not be permitted to do so as long as the activity is outside the presence of students and does not interfere with their duties or the rights of other teachers. Teachers are permitted to wear non-obtrusive jewelry,such as a cross or Star of David. How do I respond if students ask about my religious beliefs? Some teachers prefer not to answer the question,stating that it is inappropriate for a teacher to inject personal beliefs into the discussion. Other teachers may choose to answer the question straightforwardly and succinctly in the interest of an open and honest classroom environment. Before answering the question, however, teachers should consider the age of the students. Middle and high school students may be able to distinguish between a personal view and the official position of the school; very young children may not. In any case, the teacher may answer at most with a brief statement of personal belief —but may not turn the question into an opportunity to proselytize for or against religion. Teachers may neither reward nor punish students because they agree or disagree with the religious views of the teacher. Religious Expression of Students - May students express religious views in public schools? In Religion in the Public Schools: A Joint Statement of Current Law, 35 religious and civil liberties organizations give the following summary of the rights of students to express their faith in a public school: Students have the right to pray individually or in groups or to discuss their religious views with their peers so long as they are not disruptive. Because the Establishment Clause does not apply to purely private speech, students enjoy the right to read their Bibles or other scriptures, say grace before meals, pray before tests,and discuss religion with other willing student listeners. In the classroom, students have the right to pray quietly except when required to be actively engaged in school activities (e.g., students may not decide to pray just as a teacher calls on them). In informal settings, such as the cafeteria or in the halls, students may pray either audibly or silently, subject to the same rules of order as apply to other speech in these locations. However, the right to engage in voluntary prayer does not include, for example, the right to have a captive audience listen or to compel other students to participate. May students express religious views in their assignments? How should public schools respond to excusal requests from parents? In A Parent’s Guide to Religion in the Public Schools, the National PTA and the First Amendment Center give the following advice concerning excusal requests: Whenever possible, school officials should try to accommodate the requests of parents and students for excusal from classroom discussions or activities for religious reasons. If focused on a specific discussion, assignment,or activity, such requests should be routinely granted in order to strike a balance between the student’s religious freedom and the school’s interest in providing a well-rounded education. If it is proved that particular lessons substantially burden a student’s free exercise of religion and if the school cannot prove a compelling interest in requiring attendance, some courts may require the school to excuse the students. May public schools accommodate students with special religious needs? Public schools are sometimes asked to accommodate students with special religious needs or practices. Sensitive and thoughtful school officials may easily grant many of these requests without raising constitutional questions. Muslim students, for example, may need a quiet place at lunch or during breaks to fulfill their prayer obligation during the school day. Jehovah’s Witnesses ask for their children to be excused from birthday celebrations. As long as honoring these requests is feasible, school officials should do so in the spirit of the First Amendment. Administrators and teachers should not, however, be placed in the position of monitoring a child’s compliance with a particular religious requirement. Enforcing religious obligations such as prayer, dietary restrictions, or wearing a head covering is the responsibility of parents, not teachers. May students form extra curricular religious clubs? The Equal Access Act passed by Congress in 1984 ensures that students in secondary public schools may form religious clubs, including Bible clubs, if the school allows other “non curriculum-related groups.” The Act is intended to protect student-initiated and student-led meetings in secondary schools. According to the Act, outsiders may not direct, conduct, control, or regularly attend” student religious clubs, and teachers acting as monitors may be present at religious meetings in a non participatory capacity only. The U.S. Department of Education in “Religious Expression in Public Schools” gives the following guidance for interpreting the Equal Access Act: The Equal Access Act is designed to ensure that, consistent with the First Amendment, student religious activities are accorded the same access to public school facilities as are student secular activities. > Student religious groups at public secondary schools have the same right of access to school facilities as is enjoyed by other comparable student groups. Under the Equal Access Act, a school receiving Federal funds that allows one or more student non curriculum-related clubs to meet on its premises during noninstructional time may not refuse access to student religious groups. > A meeting, as defined and protected by the Equal Access Act, may include a prayer service, Bible reading, or other worship exercise. > A school receiving Federal funds must allow student groups meeting under the Act to use the school media including the public address system, the school newspaper, and the school bulletin board—to announce their meetings on the same terms as other non curriculum related student groups are allowed to use the school media. Any policy concerning the use of school media must be applied to all noncurriculum-related student groups in a nondiscriminatory manner. Schools, however, may inform students that certain groups are not school-sponsored. > A school creates a limited open forum under the Equal Access Act, triggering equal access rights for religious groups, when it allows students to meet during their lunch periods or other noninstructional time during the school day, as well as when it allows students to meet before and after the school day. May students distribute religious literature in school? An increasing number of students are requesting permission to distribute religious literature on public-school campuses. According to the guidelines issued by the U.S.
F I R S T A M E N D M E N T C E N T E R - Works to preserve and protect First Amendment freedoms through information and education. The center serves as a forum for the study and exploration of free-expression issues,including freedom of speech, of the press and of religion, the right to assemble and to petition the government. The First Amendment Center, with offices at Vanderbilt University in Nashville, Tenn., and Arlington, Va., is an independent affiliate of The Freedom Forum and the Newseum, the interactive museum of news. The Freedom Forum is a nonpartisan foundation dedicated to free press, free speech and free spirit for all people. Through its Religious Freedom Programs, the center helps schools and communities throughout the nation address issues concerning religion and values in public education. A Teacher’s Guide to Religion in the Public Schools is one of a series of consensus documents on religious liberty and public education published by the center.